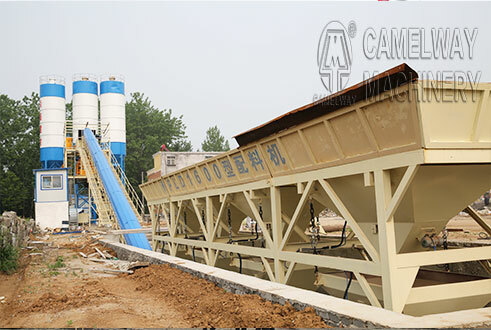 Adopted advanced technology, CamelWay concrete mixer is produced with many year’s researches and experience. To improve functions of mixer, strict manufacturing process & reliable famous brand components are applied in it. Automatic electric oil pump reduces shaft’s friction, extend service life, lower failure rate of lubricating system. Manual & hydraulic open type are available. Hydraulic discharging pushes door smoothly, reduces to damage discharging door. Besides, it even can work in low temperature region. Manual type can be used in emergency. Aggregates are lifted into storage silo. It is equipped with many advantages, such as compact structures, reliable quality & easy maintenance. 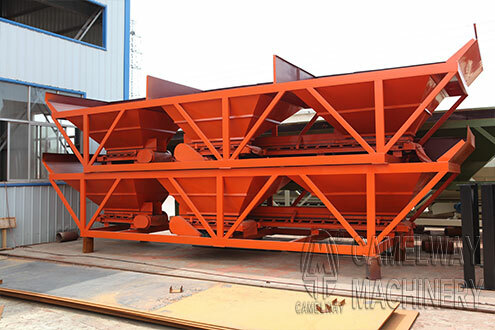 Aggregates batching machine is formed with aggregates storage silo, weighing system & belt conveyor. Water supply is consisted of water pump, pipe and cistern.The rotation of pump in mixer will keep pressure in pipe.Water will be supplied by pipe when signal appears.The control system can close automatically when water meets needs. In operational principle, additive system is similar to water supply. However, additive pump adopts corrosion-resistant plastic. Screw conveyor assembled with imported components convey cement to mixer in a large inclination angle. Pressed air is transferred into solenoid valve through pressure regulating valve, lubricators by air compressor. Then valve will receive the signal and control cylinder to push discharging door. Electrical control system is divided into two parts, mixer control system and batching machine control cabinet.They can work together.